Disclaimer: I am a Stonyfield YoGetter blogger, and this sponsored post is written by me in partnership with Stonyfield and Badger Balm. All opinions are always my own. Summer makes for looong days. School is out and there is a whole day to fill, every day of the week. It can be a bit overwhelming. While we love our relaxing days at home in the summer, and we often stay inside to beat the heat, we also like to break things up and go out! Unfortunately, everyone else is going out with their school aged children as well. This can make for lots of crowds, and a lot of older children. It’s not ideal for taking a toddler out. Places like the trampoline park, and indoor play areas are packed, and often become dangerous for toddlers because of all of the bigger kids running around. Going to places like the zoo also means crowds. Not to mention, it’s just HOT. We prefer to save activities like the above for spring and fall. The weather is much better, and the crowds are perfect- mostly made up of stay at home moms with their little ones. The big kids are still in school. So, what do we do in the summer then? We lay low, honestly, and do simple things that are a bit less “popular”. This also helps to keep the summer relatively inexpensive. We aren’t paying to go to the popular places you think of in the summer. We are doing free things, and even saving more money by packing a lunch and bringing our own snacks. Playgrounds are completely free and always fun. Toddlers are the perfect age for playgrounds. They are independent enough to do most things on their own, and they can stay forever. Helpful hint: If your toddler is like mine and only likes to swing if swings are present, we either avoid those playgrounds (so she actually runs around), or I set a time limit on swinging. This may or may not be free for you. We had a pool with our HOA at our house, and now have one at our apartment complex. If you don’t have access to a pool, you can join a local one, or just buy a $10 kiddie pool to splash around in. Some sort of water fun is a must in the summer, however you can make it work! Another free option for water play is a local creek. We love going exploring and finding new trails and creeks. Bring some water shoes, a bucket and some shovels, and your toddler will spend all morning having fun! The Dollar Tree has tons of fun summer gadgets for $1. 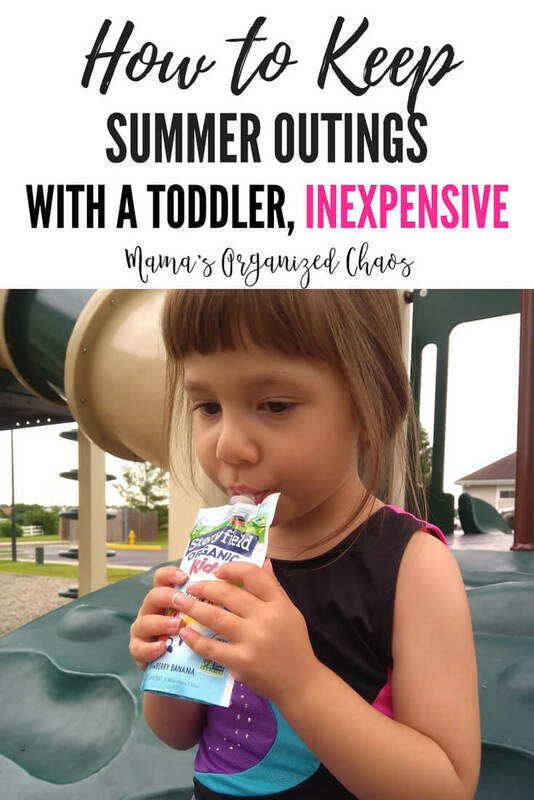 You can grab a bunch of different toys and bring them out at different times in the summer to keep your toddler engaged. We’ve found everything from jump ropes, to chalk, squirt guns, and hula hoops. Another free thing to do in the summer is to have scavenger hunts. We have a chocolate lab that we have to take on walks every morning. My toddler isn’t always excited about the walk. To make it more fun, we do a scavenger hunt. We just make it up as we go along. We look for a potato bug, then a flower, then a bird, etc. At 3.5 Caroline is a MASTER on her tricycle. She needs a regular bike with training wheels at this point, and hardly even fits on her tricycle any longer! But, she still loves riding it. We ride around the neighborhood, and have even brought it on the go. Sometimes riding in a new location is super exciting. This obviously makes for great exercise as well for both you and your toddler! We live in Maryland, and the heat and humidity are rough in the summer. We loooove to get out and about first thing in the morning. We plan to be doing our outdoor activities at 9 am, no later than 10. This really helps beat the heat and the crowds. It also ensures that we are home for lunch. We take snacks on the go for any sizable outings, but then make it home in time for lunch and nap. Many of our go to snacks are things I can leave in the car. They won’t melt, won’t spoil, and will always be there and ready. We keep packs of gold fish, pretzels, graham crackers, animal crackers, etc. in the car and handy. These are nice to have at any time in case you need them. For our morning outings, however, I like to bring fruit and pouches along for the journey as well. Pouches are the perfect mess free snack. We’ve been using them since the moment Caroline was eating solid foods. Pouches are easy to pack, they are resealable, they are healthy, and relatively mess free. Our favorites, are apple sauce pouches, and Stonyfield Yogurt pouches. 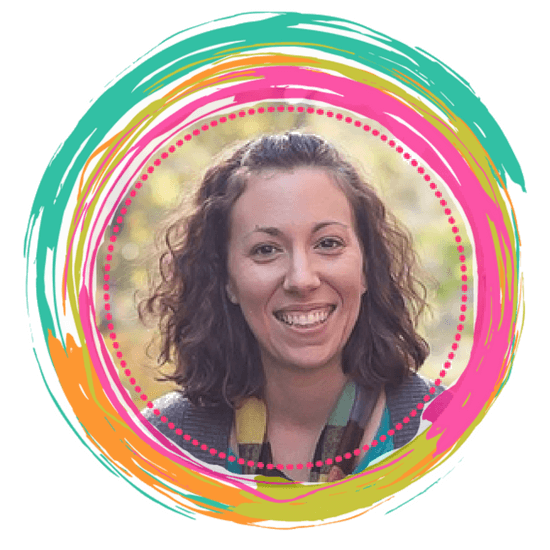 Caroline has been eating Stonyfield yogurt products since she was 6 months old. It is a brand I trust, and I always know they have the right nutrients in their yogurt for our daughter. Stonyfield brand has 25 to 35% less sugar than the leading kids’ yogurt, it is made with live active cultures, they have a wide variety of flavors (Strawberry, Strawberry Banana, Blueberry, Vanilla, Strawberry Beet berry, Pear Spinach Mango and their new flavor Choco-Moo), and Stonyfield Organic is USDA Organic, pasture raised, Non-GMO Project verified, Kosher certified and gluten free. 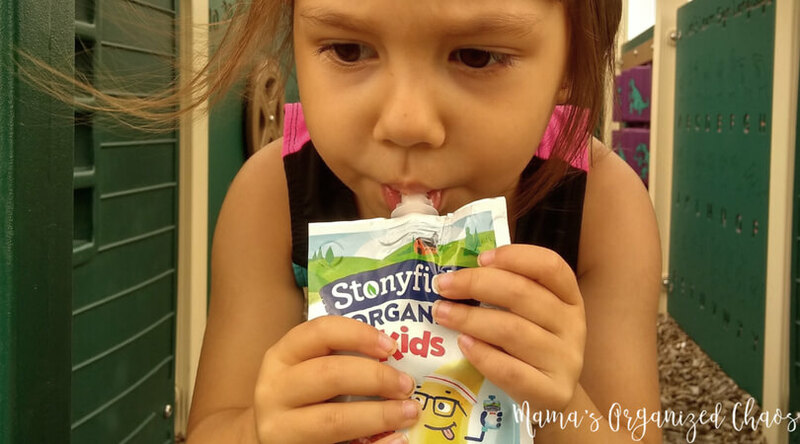 Stonyfield pouches are resealable, but I also want to give you access to an amazing product that will make them MESS free- even for babies! These pouch toppers make it impossible to squeeze the product out of the pouch. Your child has to be sucking for the product to come out. These are a genius invention! Basically, you don’t have to worry when you are buying products from Stonyfield. You don’t even have to read the ingredients. You can trust you are getting a good product and putting a healthy snack at your toddler’s fingertips. We didn’t grow up putting sunscreen on with every outing. We didn’t use more than an SPF of 4 for most of our lives! I grew up wanting a tan! Now, we know better, however. We know that we need a sunscreen that is going to protect our children from harmful UVA and UVB rays. We know to use at least SPF 30 and that any higher really isn’t helping much. We also know that slathering our children in chemicals isn’t the best thing in the world. So the compromise here is to use a good sunscreen. 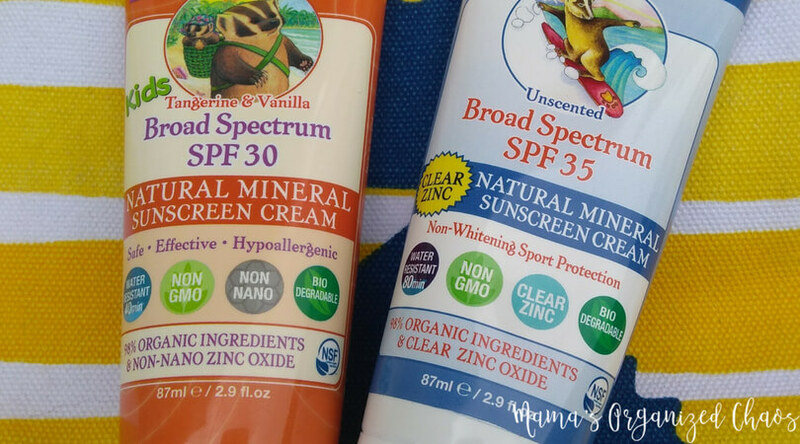 Badger Sunscreen is a non-nano zinc oxide sunscreen. Zinc oxide is the best ingredient to protect us from the harmful UV rays. Unfortunately, many of the sunscreen brands use a nano form of zinc oxide that can get into our blood stream. Badger uses non-nano zinc oxide. This basically means that the particle size is larger and is not going to be able to pass through into your blood stream. This is a sunscreen that is organic, easy on sensitive skin, safe, and works. I will tell you upfront that the texture is very different from a non-organic sunscreen. It is thick, and oily. I felt like it was hard to spread. Once it was on, however, it wasn’t greasy, and it worked well. The scent is amazing… my daughter smelled like an orange creamsicle all day! The texture is not something I like, but I am trying to get used to it since I know it is better for us in the long run. and environmental performance, accountability, and transparency. In addition to the FREE activities above, we also like to throw in a couple of camps and classes to keep things interesting. Look at your local community or recreation center. They often have very inexpensive week long camps for preschool aged children. We planned on doing one each month just to break things up. Caroline is also enrolled in gymnastics. This is something we continue during the summer. Many people take time off in the summer from these types of classes. We love to keep them going. She thrives on the consistency, and being once a week it helps to break up our days. Hope you are all enjoying your start to summer. Huge thanks to Stonyfield and Badger Balm for sponsoring this post and providing such great, trustworthy products. Mama Instinct or Mama Grief Talking?